Noir at the Bar is exactly what it sounds like. A bunch of crime writers reading their darkest, funniest, and/or punchiest stuff in a dimly lit room that smells vaguely of beer. Looser and more freewheeling than a bookstore reading (have I mentioned there's beer? ), it also happens to be a worldwide phenomenon. You don't have to take my word for it. Keith Rawson assembled an oral history of the event for LitReactor a few years back. Jen Conley wrote a terrific piece about it for the Los Angeles Review of Books. And just this week, the first Noir at the Bar Australia took place in Melbourne. I've participated in Noir at the Bars (Noirs at the Bar?) in locales as far flung as Boston and Long Beach. This Sunday, April 2nd, I'm delighted to be reading at one in my adopted hometown of Portland, Maine, alongside some of the finest crime writers New England has to offer. Wanna come? 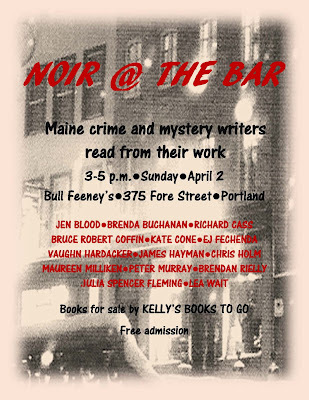 We'll be at Bull Feeney's at 375 Fore Street from 3PM to 5PM. Admission's free. Kelly's Books to Go will be on hand if you feel like taking something home with you. Hope to see you there!